Originally thought to have been constructed by David Buttolph, it is now believed that this house was built by Benjamin Belden, who purchased the property for 70 pounds in 1711 and sold it for 245 pounds in 1721. 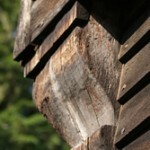 The structure was probably finished by 1714, when Belden married Anne Churchill and was licensed as a tavern-keeper. The young couple would be expected to welcome travelers into their home and to offer them food and a place to sleep. 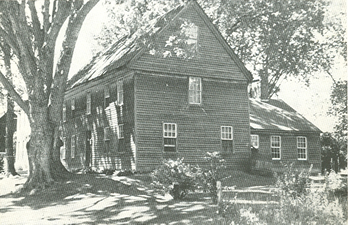 The Antiquarian & Landmarks Society (now Connecticut Landmarks) acquired the house in 1941 and opened it to the public in 1951. The building was restored under the direction of pioneer restoration architect and “interior design virtuoso,” Frederick C. Palmer. 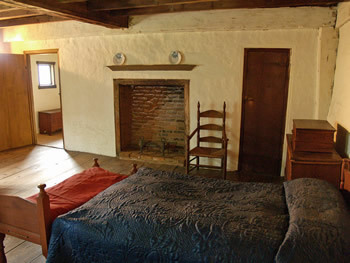 The stone foundation, the chimney stack and fireplaces, the original hewn-timber framing, and much of the interior woodwork, doors and floorboards are original. 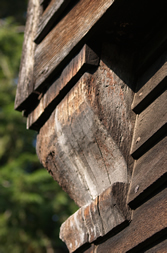 The four inch overhang at the second story level on the front and side elevations and the decorative brackets were discovered during the restoration in 1947 when the modern clapboards were removed. There was also sufficient structural evidence to determine the location, size and shape of the original doors and casement windows. Reproduction doors studded with nails and windows with diamond-shaped panes secured by leaded mullions were installed in frames the size of the originals. It is interesting to note that there was no evidence of any windows on the rear wall, perhaps because the Beldens’ anticipated a later addition, or they wanted to avoid additional expense for the glass, which had to be imported from England. The interiors of the house are a showcase for outstanding collections of late seventeenth century American decorative arts. 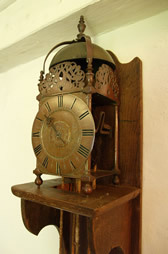 In every room, there are fine examples of Pilgrim-style furniture made in New England, some with important Connecticut associations. The best bed chamber was designed and decorated by Katherine Prentiss Murphy, one of the twentieth century’s most renowned antiques collectors. 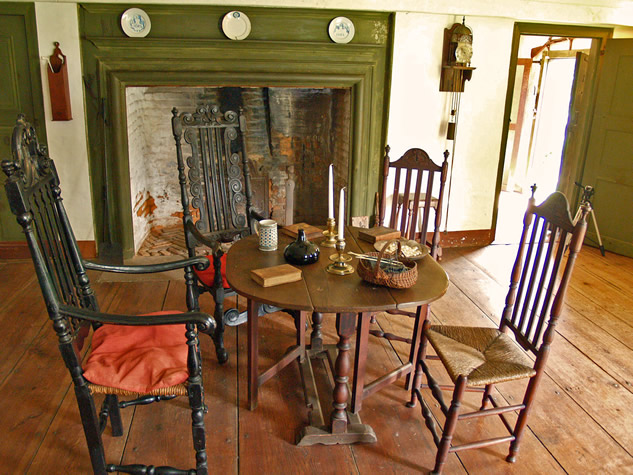 The kitchen, which has an enormous open hearth and a remarkable assortment of early colonial-era cooking utensils, wooden wares, and pewter, was equipped by Frances Phipps, author of Colonial Kitchens, Their Furnishings, and Their Gardens. 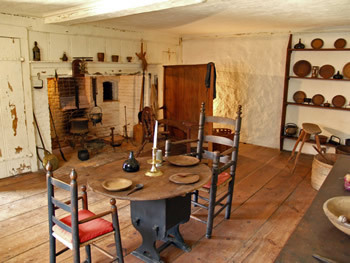 Although the current interpretation of the interior captures the spirit of Pilgrim life in New England in the 17th century, its historic importance is more as a document of the work of an earlier generation of American collectors and preservationists than as an accurate recreation of early colonial life. 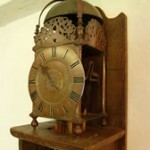 Originally, the rooms would have had less furniture with only a few high style examples. 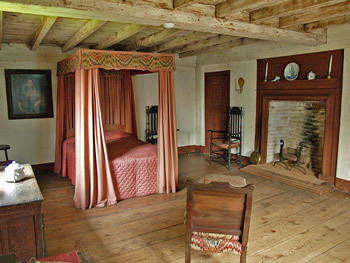 The early colonists were also fond of color and painted both their furniture and paneling with decorations. 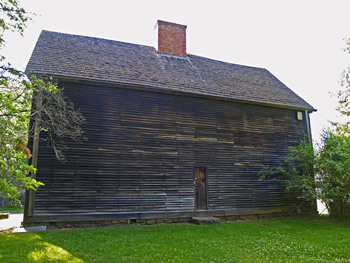 The medieval appearance of the exterior and the romantic interiors inspired local author Elizabeth George Speare to use the Buttolph-Williams house as the setting for her novel for young adults, The Witch of Blackbird Pond (first published in 1958). This story of a young orphaned girl from Barbados who arrives unannounced to live with her Aunt and Uncle in Wethersfield, addresses the issues of ignorance, illiteracy, prejudice and superstition in a small, 17th century settlement. The book won the John Newbery Medal for distinguished contribution to American literature for children in 1959 and continues to be required reading for many elementary school students in the United States. The Webb-Deane-Stevens Museum manages the Buttolph-Williams House, giving tours and teaching school groups about the house and The Witch of Blackbird Pond. The novel is available for purchase in the Museum Shop.